A man who shot and killed three people at random on the streets of downtown Fresno shouted "God is great!" in Arabic during his arrest Tuesday and had posted on social media that he disliked white people, authorities said. Kori Ali Muhammad, 39, was arrested shortly after the morning rampage that left three white men dead, police said. Muhammad, who is black, fired 16 rounds in one minute at four places within a block. He walked up to a utility truck and shot a Pacific Gas & Electric Co. employee sitting in the passenger seat, authorities say. The driver of the truck sped off to the police department for help but the man died. Another victim was gunned down in the parking lot of a Catholic Charities building. "These individuals who were chosen today did not do anything to deserve what they got," Fresno Police Chief Jerry Dyer said. "These were unprovoked attacks by an individual that was intent on carrying out homicides today. He did that." It's too soon to say whether Muhammad, who was homeless, had ties to any militant groups or causes, Dyer said. 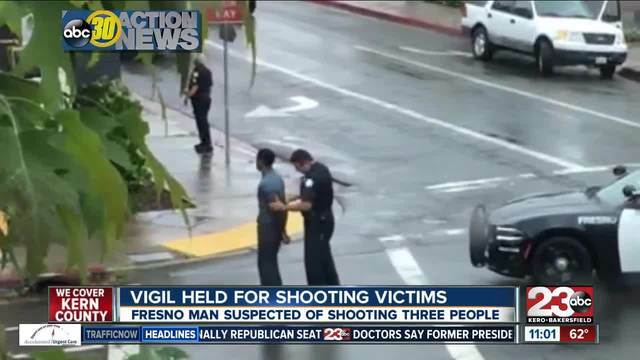 Muhammad also was wanted in connection with another shooting last week that killed a security guard at a Fresno motel who had responded to a disturbance. The security guard also was a white man. Authorities on Tuesday spotted Muhammad running and took him into custody, the police chief said. He also had shot at a fourth person and missed. Police are looking for the revolver. Two of the victims may have been clients of Catholic Charities, Dyer said. The nonprofit organization doesn't believe Muhammad was tied to Catholic Charities, spokeswoman Teresa Dominguez said. It provides a variety of services for refugees, the homeless and those for disabilities. Muhammad has a criminal history that includes arrests on weapons, drugs and false imprisonment charges and making terrorist threats, police say. He had been associated with gangs but was not a validated member. Seyed Ali Ghazvini, imam of the Islamic Cultural Center of Fresno, said Muhammad was not a member of his congregation and he did not recognize him. The imam said he is consulting with other faith leaders. "We're kind of shocked and surprised for what happened," Ghazvini said. "We are very sorry for this to happen. We offer condolences for the victims, we pray for the victims and their families."